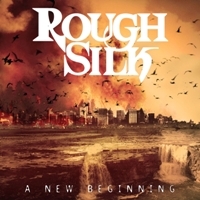 I don’t quite know how this band ROUGH SILK has managed to escape my attention<?xml:namespace prefix = o ns = "urn:schemas-microsoft-com:office:office" /> since 1989 till now... but they have and that’s kind of sad because I actually really dig what they have to offer here. ‘A New Beginning’ is their 20th anniversary album and the very first time I took a listen to the 13 tracks there are to be found I felt that the songs was too predictable and I felt I had heard every riff and every chorus before. But of course I gave this release a new chance... and another and suddenly something happened; Suddenly I enjoyed the 13 songs. Suddenly I enjoyed the riffs and the choruses that very well could have been written by ACCEPT or U.D.O. Suddenly I enjoyed the vocals from Ferdy Doernberg who shifts between clean vocals and rough vocals that actually reminds me very much of UDO DIRKSCHNEIDER himself. Well... the bottom-line is that if you’re looking for a groundbreaking release, then look somewhere else. However if you’re looking for a catchy melodic metal release suitable for your next metal-party with all your friends... look no further.